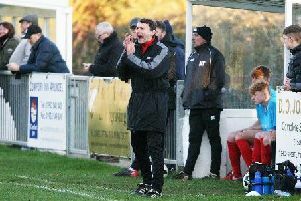 Bob Paine praised East Preston Football Club’s resolute defensive display as they picked up a Southern Combination League Premier Division point at high-flying rivals Pagham last night. EP managed to deal with all the Lions had to throw at them and earned a 0-0 draw at Nyetimber Lane. Pagham’s potent strikeforce have caused defences across the division no end of problems this season but Paine’s backline stood firm to keep them out. East Preston goalkeeper Ben Purkis put in an inspired display to ensure his side came away with a point. Paine’s side were facing a daunting trip, coming up against the SCFL Premier Division’s highest-scorers this season. Pagham striking duo Daniel Simmonds and Callum Overton have found the net 29 and 18 times respectively in the league alone but East Preston managed to keep them quiet. Paine felt the performance and result shows what his young squad are capable of at this level. He said: “I could not have been any prouder of my team for the performance they put in. We knew going to them would be one of the toughest tests we’d face this season, so to come away with a point was really pleasing. “I don’t like to pick individuals out but goalkeeper Ben (Purkis) was sensational for us. He pulled off a number of good saves and played a key part in us getting something from the match. A combination of fine goalkeeping from EP stopper Purkis and some wayward finishing meant Pagham were held at home. East Preston did threaten through substitute Hayden Hunter and Jake Heryet in the second half but took a point for their efforts in the end. Paine’s team now face a busy weekend of action as they play twice in the space of three days. East Preston make the trip to Eastbourne Town, who have lost their past two matches, on Saturday and then go to struggling Worthing United on Easter Monday. But on the back of an impressive performance and result at Pagham, Paine is not daunted by either trip. He said: “We’ve got a decent record against teams at the top this season, so we’ll have nothing to fear at Eastbourne Town. “They’re on the back of a couple of defeats and I’m sure they’ll be looking to put that right against us. “We’ve beaten Saltdean United twice this season and overcame Three Bridges - both teams fighting for promotion - there is no reason why we can’t pick up a result against them. “Worthing United will be something of a different proposition. We haven’t fared as well as we’d have liked against sides in and around us this season. Picture slideshow: Five-star East Preston ease past struggling Eastbourne United. EAST PRESTON: Purkis; DaCosta, Lyne, Etherington, Beaney; Searle, Barnes; Heryet, Huet, Brodie; Tilley. Subs: Hunter (Tilley, 61), Donaldson, Josh Parazo, Gilbertson, Quirke.